Since 6am Tuesday 29th August to now the man who has perhaps fought more constitutional cases in the courts of Trinidad and Tobago protecting the rights of citizens, often times pro bono, has been in detention by the Police for a conversation three years ago which he categorically denied having . A battery of police sneaked up on the residence of Attorney Anand Ramlogan as if this officer of the court was a fugitive from justice; despite the fact that only weeks ago Anand asserted publicly that he was available for questioning if asked. Ten police vehicles descended on the Palmiste residence of Anand Ramlogan compared to when an ordinary man is often told that there is no vehicles to attend to any complaints. Why then all the drama ? Why Now ? In the face of an unambiguous and ubiquitous incompetence and ineptitude by the Political Administration a distraction was much needed. The national conversation needed to be changed urgently as the Ferry Fiasco, where a Minister of Government, A State Board (past and current) and a call for the sitting Prime Minister to appear before a Joint Select Committee of the Parliament of Trinidad and Tobago loomed large on the horizon. The illegal appointment and corruption of the constitution where the office of the Prime Minister is implicated in the appointment of Senator Le Hunte showed that the rule of law was compromised. What is amazing is the alacrity in which the police swooped down on Anand Ramlogan in the particular matter relative to other cases. I had filed complaints over the years with the Integrity Commission against particular individuals such a PNM Minister of Finance, a PNM Minister of Culture and a PNM Prime Minister where these issues have been referred to the DPP and essentially no further action has been taken. 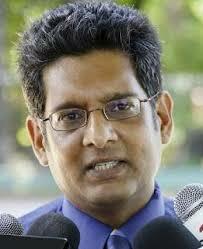 Yet in the matter involving Anand Ramlogan he has been detained. It appears that there is one law for the PNM in Trinidad and Tobago and another law for the rest of the country.